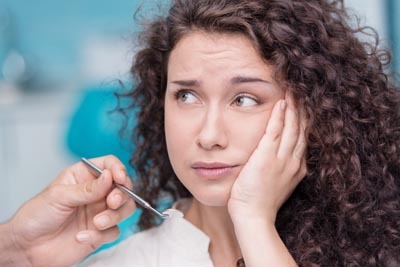 Removing a tooth infection and filling the canal where the nerve was removed is called a root canal treatment (also known as endodontic treatment). When the nerve in a tooth dies, the infected tissue needs to be removed by either extracting the tooth, or performing a root canal therapy (endodontic treatment). You will need a root canal treatment if your tooth has infected or dead pulp. The two most common causes of infection in the pulp are deep cavities or fractures & broken teeth. Both expose the pulp to bacteria that live in your mouth. These bacteria can cause an infection that can damage the pulp. Without treatment, the pus from the infection can eventually gather down at the root tip and pass into the jawbone, causing an abscess and damage of the bone that surrounds the tooth. The resulting pressure inside the bone and ligaments can cause severe pain, and if left untreated, can even be life threatening. We employ the use of several tests and x-rays to diagnose your condition so you can begin treatment immediately. On the other hand, you may have been completely unaware that you had an infection because you experienced no symptoms at all and lesion of infected root could be diagnosed only with x-rays. After Root canal treatment teeth become more brittle and have significant missing part of tooth structure after decay removal. A crown (a cap) is recommended to protect treated tooth from possible fractures. It is normal to feel some tenderness in the area of treatment for few days after root canal therapy. Your jaw may also be sore from keeping your mouth open for a long period of time. These symptoms are temporary and usually respond well to pain medications. Call Hummingbird Dental Studio to set up a consultation and learn more about the process.